Starting with Portfolio for Jira Server 2.20, the new planning experience is already enabled as an early access feature in your Jira instance. 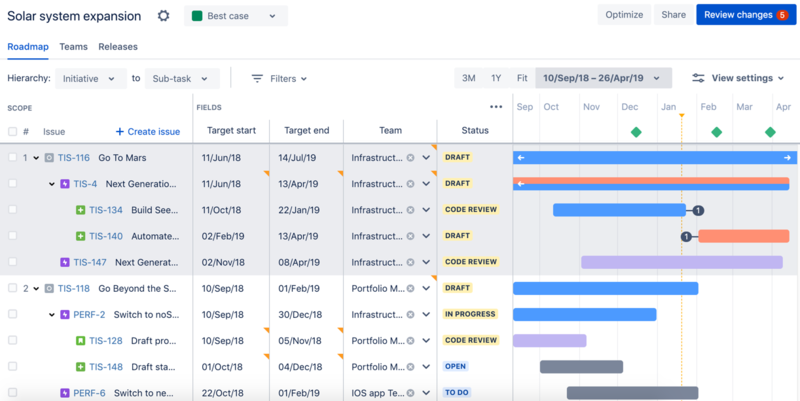 With the early access feature already enabled in Jira, you'll only need to enable the new experience in each plan, to start using the new functionality. Note that a plan will not get the new interface until the new experience is enabled in the plan itself. This applies to both existing plans and newly created plans. If you prefer to use the previous layout, you can disable the new experience in a plan. You can also choose to disable the new experience as an early access feature from your Jira instance, if you prefer not to use the new experience in any of your plans. After enabling the new experience, the plan will have the new layout. See Setting up the new experience to know how to enable the new layout in a plan. There are loading limits to take note of when using plans in Portfolio for Jira. Loading limits essentially restrict the number of issues that can be loaded into a plan. Loading limits prevent the schedule of a plan from becoming too large for Portfolio for Jira to process. If a plan becomes too large, this can cause your Jira instance to time out. To prevent this, you can consider creating multiple plans and spread the work across these plans, or you can remove certain issues from the issue sources that you've connected to the plan. The number of issues you can load into a plan. The absolute limit is 5000. The number of projects you can load into a plan. The project limit is 100. The number of teams you can access via shared team settings. The team limit is 50. If you have more than 50 teams, some teams won't be displayed directly in the shared team settings page. To find teams that are not displaying, enter the team name in the search box. These limits do not apply to classic plans. See classic plan limits instead. In Jira, go to Portfolio (in header) > Create. The 'Create' dialog will be displayed. Give your plan a name. If you select private, only you can view, access, and edit the plan. No other user can view or even search for the plan, including Jira administrators and system administrators. You can change the privacy option as necessary. Choose the issue sources (boards, projects, filters) that you want to use for your plan. If you choose a Scrum board as one of your issue sources, you'll also be asked to choose how you want to estimate your issues. We recommend that you use story points. See What is a Portfolio plan to know more about issue sources. Choose the releases that are relevant to your work, then click Next. You'll only need to choose releases if there are existing releases in Jira, that are associated with the selected issue sources. By choosing the relevant releases, the issues assigned to these releases will display in your plan. Note that for plans that have boards as issue sources, Portfolio for Jira will suggest the velocity for the team. The suggested velocity will be based on past performance, i.e. if the team previously completed any sprints in the corresponding boards. Delete a team that you don't need to include in your plan, by clicking more ( ) > Delete. You can also add, configure, and delete teams from within a plan. See Adding and removing teams for more details. Confirm the issues that you want to include in your plan by selecting the corresponding checkboxes. By default, all the issues are selected. Filter the issues by project, issue source, issue key, or issue summary as needed. When you've marked all the issues you need, click Done. Newly created plans will display issues that start from the highest hierarchy level that has at least one issue. If your issue sources contain at least one issue at the initiative level, then the plan will display issues starting with initiatives in the scope section. If no issues are defined from the issue sources, the plan will display issues at the epic level by default. In the new experience, you can update the settings of a plan at any time. Rename a plan Hover over the name > enter a new name > click Enter. Before you update the issue sources of a plan, note that changing the issue sources will affect the scope, releases, and teams in your plan. In your plan, click settings ( ) > Configure > Issue sources. Click Edit issue sources. This will display the 'Create plan' wizard. Select your issue sources from existing boards, projects, and filters, and then click Next. Select the releases to include in your plan, and then click Next. Select the issues to include as the scope of your plan, and then click Done. See Configuring plans for more details. Click settings ( ) > Delete.